Congratulations to Benni Bødker’s nomination for the The Orla Prize! The Orla Prize is a literary prize named after Orla Frøsnapper (Orla frog-eater)–the protagonist in Ole Lund Kirkegaard’s children’s book with the same name. It’s a price for and by children–children nominate, vote and select the winner every year. The Orla price is collaboration between Danish Radio and the Reading campaign carried out by the Ministry of Culture, Ministry of Education and Ministry of Social Affairs. The prize was awarded for the first time in 2005. After their success with Steve Sem-Sandberg’s novel The Emperor of Lies, Faber in the UK was one of the first publisher to commit to yet another fantastic novel by the author. We are happy to say that DE UTVALDA (The Chosen Ones) will also be published by Faber. Benni Bødker has received the School Library Association’s Author Price 2013. The prize is awarded to a Danish authorship that has contributed to the development of children’s and young reader’s experiences and/or knowledge. 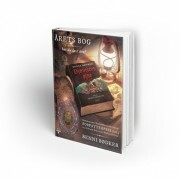 Benni Bødker receives the price for an authorship that with it’s fast paced and action packed series manages to catch the reluctant readers–once they have entered a world created by Benni Bødker they will find it difficult to let go. THE DEVIL’S EYES, the book chosen to represent his authorship, is a unique and yet classical pirate story. The book takes off at a cemetery and ends with a man in a garret and within this narrative frame the reader will learn of a young boy, an evil captain and a great treasure. WE WELCOME JESSICA SCHIEFAUR TO THE AGENCY! With her stunning novel, The Boys, Jessica Schiefaur has established herself as one of our most interesting literary young adult authors in Sweden. We are proud to welcome her to Nordin agency! Jessica’s writing raise the important questions that adolescense brings and is about the defining moment in life that the leap from teen to adult means. With unadorned style, powerful images and a languge that is both soft and severe her thrilling novel has impressed both readers and critics. The Boys, the play is opening at Uppsala City Theatre on October 9 and will tour with the National Theatre later in the fall. The Boys is nominated for the Nordic Council Children and Young People’s Literature Prize, the winner will be announced in Oslo on October 30 and the ceremony will be broadcasted throughout Scandinavia. http://www.nordinagency.se/wp-content/uploads/2014/02/new_logo.png 0 0 nordinagency http://www.nordinagency.se/wp-content/uploads/2014/02/new_logo.png nordinagency2013-10-04 10:28:572016-05-13 11:18:05WE WELCOME JESSICA SCHIEFAUR TO THE AGENCY!